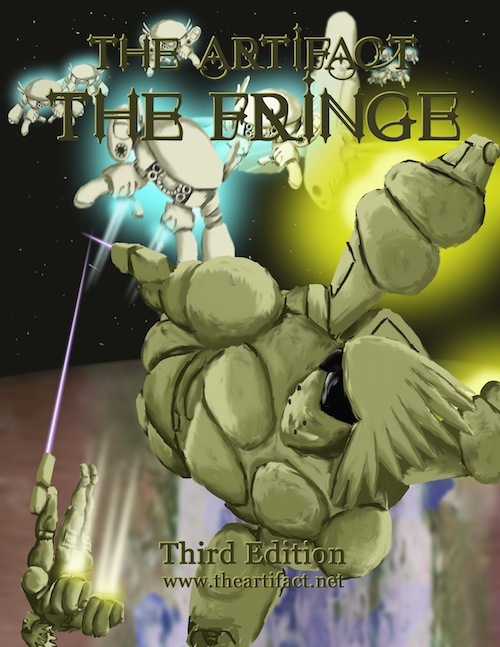 The Fringe was the first sourcebook I published for The Artifact but it’s never had a cover. Today that’s changed! A bot pilot flees from a horde of Chezbah Intercepters. Cool artwork, as always! Is there a way to pull the text out of the background? People with visual impairment might find the low contrast a bit tricky! Its amazing what a huge difference a cover makes to its acceptability. Thanks! I found getting the contrast right on this cover to be really difficult. Light colors blended in in places where dark blended in in others. I went all over the spectrum looking for a color that would stand out but not look horrid. Printing the text on another layer is likely to turn out a hairy mess. I love to support anyone with disabilities when I can but this one might not work out since I had to write the text twice and overlapp them to get the little bit of contrast I could get. I’ll try with any updates, but I’m not sure how to make that work.